Joy Richards is the Vice-President of Health Professions and Chief Nursing Executive at University Health Network in Toronto. 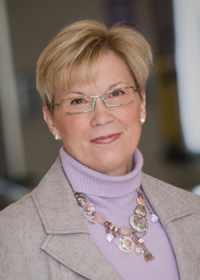 Dr. Richards is the immediate Past-President of the Academy of Canadian Executive Nurses (ACEN) and holds a teaching position at the University of Ontario Institute of Technology (UOIT). She holds clinical appointments at the University of Toronto, York University and Humber College. Dr. Richards focus and passion is in the area of clinical leadership, quality of work life environments and the development of client-centred practice settings, with a special focus on excellence in geriatric care. Her previous experience includes progressive senior nursing management positions in the acute care and long-term care sectors; nursing education and nursing informatics and has presented her work, both nationally and internationally. Dr. Richards holds a a PhD and a MA in Human and Organizational System (Fielding Graduate University), a BScN in Nursing and a MN in Nursing (University of Toronto). Dr. Richards is also a graduate of the Queen’s University Executive Program and is a Johnson & Johnson Wharton Fellow (University of Pennsylvania).